This past October, the City of Bryan partnered with Texas A&M University including the Department of Engineering, Texas A&M Engineering Experiment Station (TEES), and Texas A&M Transportation Institute to offer self-driving trolleys in historic Downtown Bryan. Why are these considered to be self-driving trolleys rather than autonomous trolleys? There are different classes of autonomous vehicles varying in degree of autonomy. Because these vehicles have the opportunity for human intervention at all times, they are classified as self-driving. At all times of operation, two Texas A&M Engineering Experiment Station (TEES) staff members will be present in each trolley. What is the route for the self-driving trolley? There are five different pick-up/drop-off points (depots) marked by sandwich board signage during the hours of operation. For the first 30 days of the program, TEES will operate two trolleys for two hours a day between the hours of 10 AM and 4 PM, Monday through Friday. After these first 30 days, there is an opportunity for the schedule to be modified. 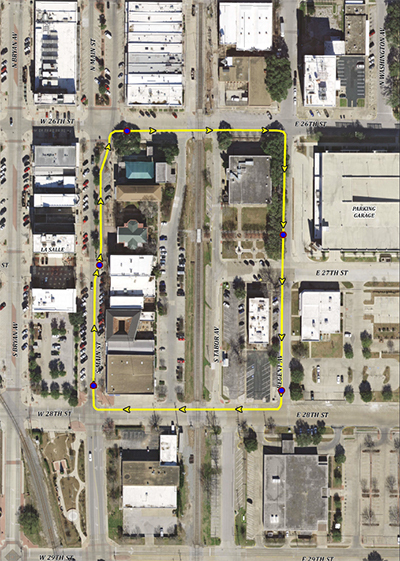 How was this route determined and why was Downtown Bryan selected as the location? In contrast to other programs, the Downtown Bryan location provides a pedestrian rich environment for both foot and bicycle traffic. This route offers numerous, real-life challenges to the AI technology, providing an opportunity for researchers to gather important data. What makes this particular trolley project unique from other similar studies? These self-driving trolleys are the first of their kind to be utilized on public rights-of-way in the Brazos Valley and, to our knowledge, only the second in the nation. Who can utilize the self-driving trolley? The public is encouraged to utilize the trolleys. What are the features of the self-driving trolleys? 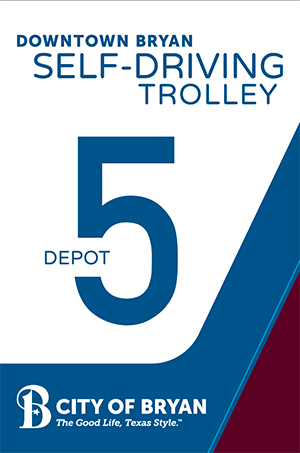 The electric trolleys accommodate 6 total occupants, 2 safety drivers and 4 passengers, and are equipped with seat belts for all riders. As part of the AI technology used to operate, the trolleys will have equipment attached to the exterior. Each are wrapped to be easily identifiable to the public. The City of Bryan is providing the vehicle wraps, stop signage and electricity for charging the vehicles. Research focuses on mapping, localization, guidance, navigation and control for developing autonomous ground and aerial vehicles. A specific goal is field deployment of autonomous vehicles in applicable environments, offering a sustainable mode of public transportation and another opportunity for mobility. This is a multi-faceted program that includes the efforts of the City of Bryan, Texas A&M College of Engineering, Texas A&M Engineering Experiment Station (TEES), Texas A&M Transportation Institute (TTI), and Governor’s University Research Initiative (GURI).